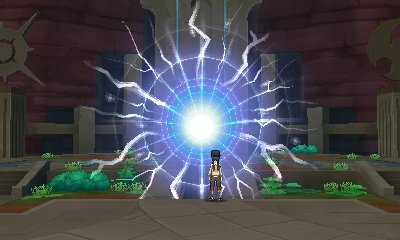 After you have defeated Lusamine and rescued her from Ultra Space, when you return to the Altar of the Sunne or the Altar of the Moone depending on your game, you will find that there's still a wormhole remnant. This is actually a small wormhole that you actually have the ability to go through, but there are a few conditions. First, you need to have either Solgaleo or Lunala in your party. Second, the wormhole only opens up at certain times. The alternate world essentially inverts the time, so Day becomes Night and Night becomes day. This isn't a version exclusive feature, so if you trade Lunala over to Pokémon Sun, you'll be able to activate the wormhole during the day. 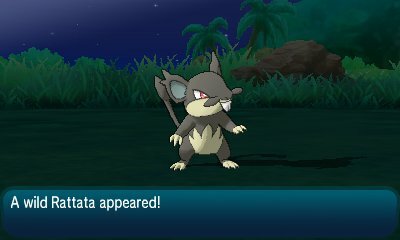 Despite this, this feature does not change the wild Pokémon you'll encounter, so if you're playing Sun you will still encounter Vulpix rather than Sandshrew, and Rockruff & Cosmoem will still evolve into the version specific evolutions. Another feature is that this is the only way to get the Legendary Pokémon Ultra Beast, Cosmog. 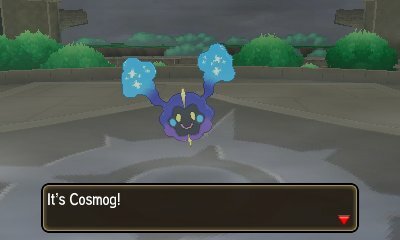 Cosmog is not found in the native world, but is in fact found in the Alternate World. When you have gone through the portal go to the Lake of the Sunne or Lake of the Moone from Ula'ula Meadow and reach the altar, with the cover legends still in your party. Cosmog will then appear. You don't need to battle it, it will join you automatically. It can evolve into Cosmoem and then into another Solgaleo in Sun or another Lunala in Moon. You can only get one Cosmog per game.